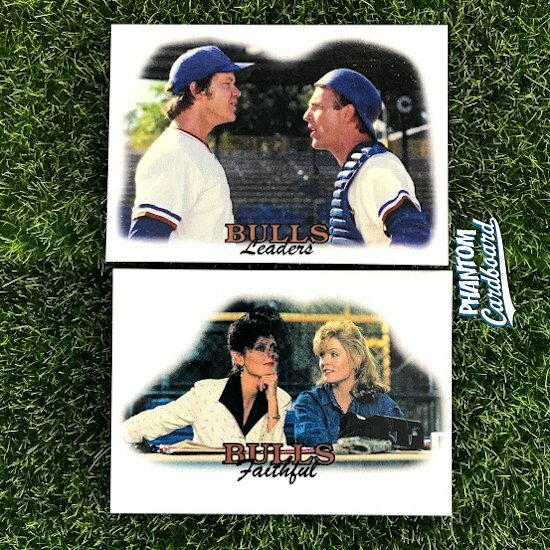 I previously had made a Bull Durham mini-set that consisted of five cards. 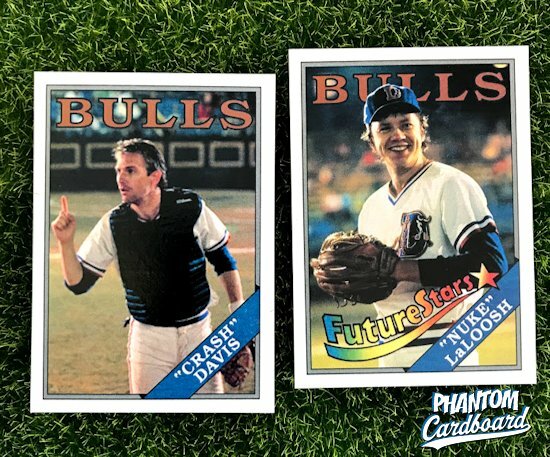 About month of so back I rewatched Bull Durham for the first time in a long time and realized I left a lot of fun cards on the table, so I went back and gave the set a re-up. 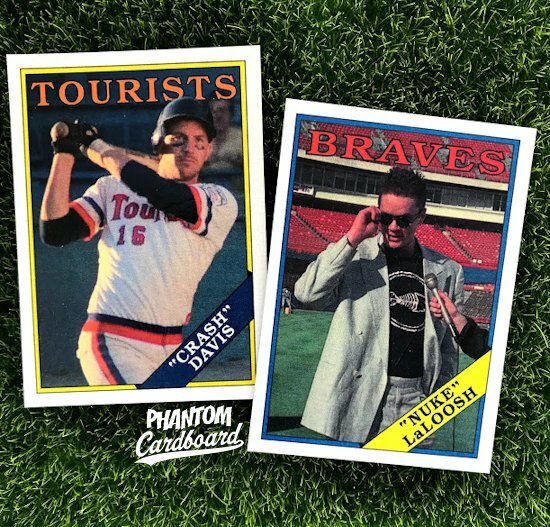 The movie had a few details in it that I wanted to match up with different elements found in the 1988 Topps baseball inspired design that the mini-set was made in the style of. The Crash card saw the least change getting a bit more of a stylized parenthesis around Crash. I gave the same treatment to the Nuke card plus added the "Future Stars" logo for the young fireballer. I added a Joe Riggins card. It seems like a pretty big character to omit the first time around. The reason he wasn't in the original mini-set was that the first few I made were not done with the idea of making a set but rather for the purposes of getting an autograph through the mail, and since Trey Wilson passed away in 1989 it would prove pretty difficult to get the card signed. 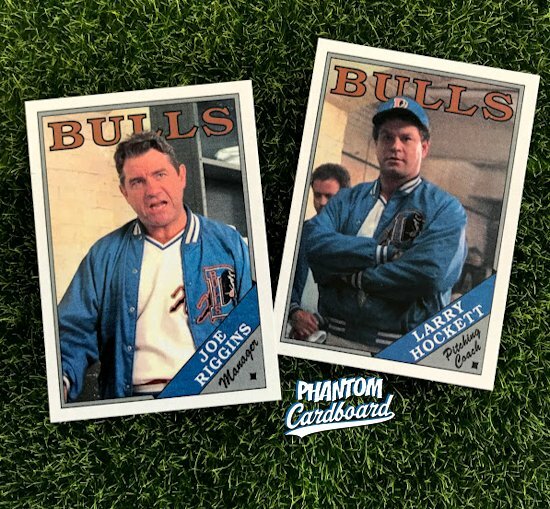 The Larry Hockett card got the addition of the "Pitching Coach" designation which is pretty cool to me because even though the '88 Topps was monstrous in the number of cards it had, it didn't go quite that deep as to include pitching coaches. 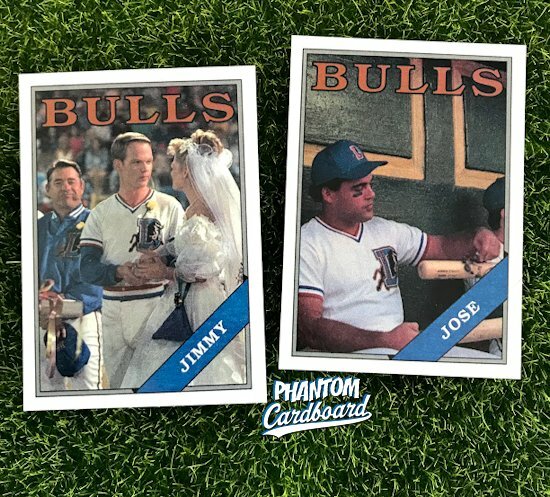 Next there's the addition of Jimmy -getting married to Millie- and the Switch Hitting Witch, Jose. These two cards I got really excited about when I was reminded of the records that were broken during the movie. Although Crash would never have wanted his dubious distinction of being Minor League Baseball's all-time home run leader acknowledged, but I had to immortalize the milestone on cardboard. And then there was the litany of records Nuke broke on his first trip to the mound as a Durham Bull. The Team Leaders card was another I was really excited about. The meeting on the mound, to me, was one of the movie's funniest scenes. Tim Robbins played a man-child to a T.
My original mini-set had both a Millie and Annie Savoy card. I, in a sense, retired those two cards. Just because they weren't actually members of the team. I still felt the mini-set needed them so I came up with a special fan card in the style of the Team Leaders card. These last two would be perfect as like a couple of "Topps Traded" style additions. If you don't remember Crash broke the minor league home run record as a member of the Asheville Tourists. He signed on with them after Nuke was called up and Crash was no longer needed to wean the young hurler, so Durham let him go. I did the card in the Houston Astros color scheme of the '88 Topps set. Theses days the Tourists are affiliated with the Colorado Rockies, but in 1988 their big team was the Astros. Normally I rely on the internet for my card's images. It may take dozens of searches with all kinds of keyword combinations but usually I can source an image that will work. This wasn't the case for Crash in a tourists uni; there was nothing usable. I had to have this card in my set so I did my patient best to get my own screen grabs. They never specifically mention the Major League team name when LaLoosh is called up, but we're going to assume it was the Braves since that is who Durham's big league affiliate was from 1980-97. This mini-set is available in the online card shop.